Sunday Spotlight – Spring Break Edition! I hope that you are having a fantastic week! Folks around here are either getting back from Spring Break or heading out on Spring Break. So let’s use this month’s Oil of the Month for Spring Break! 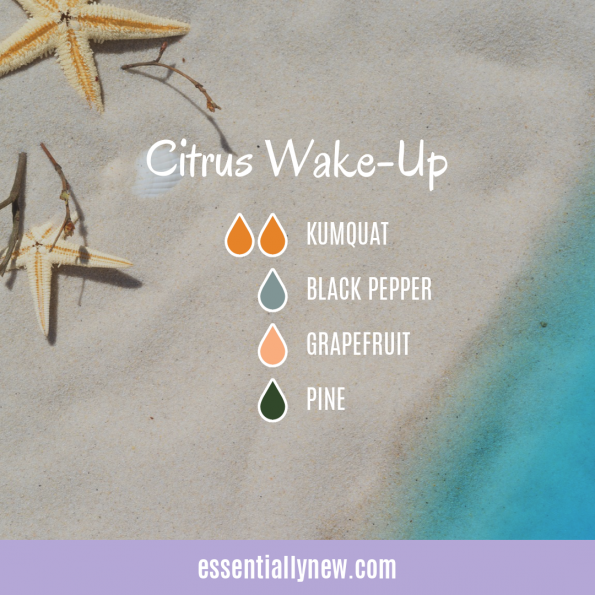 Kumquat blends so well with so many things. Citruses are typically like that. Best friends with everyone. Getting up early to get to the day’s activities is something you have to do when you travel, especially if you are changing time zones. So here is a blend for waking up in the morning. Blend together and diffuse. This recipe can also be tripled and added to a personal inhaler. Or this recipe can be added to a 10 mL roller bottle and topped with the liquid carrier oil of your choice – fractionated coconut oil or almond oil are good choices. I’m really liking hydrosols lately for linen sprays. It’s probably because they are super convenient – no mixing or diluting required! You can try lavender or chamomile hydrosols for bedtime. I do a spritz or two and we are good to go. Since hydrosols have a pretty short shelf life when they aren’t refrigerated, I’ll pour a little into a small spritzer bottle for travel and not worry too much about keeping it cold. Bonus – both of these hydrosols are EXCELLENT for sun over-exposure! If you keep them cold, it’s even more amazing! Spray a little of these babies on that pink skin and then put aloe on top. Double duty!